For its 1922 Broadway production, Hindle Wakes was retitled Fanny Hawthorn because “wakes,” the late-summer bank holidays of Lancashire municipalities in Britain, failed to register with American audiences. Those end-of-summer vacation days are the social background of Houghton’s story about youthful hormones and small-town hypocrisy. Nathaniel Jeffcote (Jonathan Hogan, right) confronts wayward son Alan (Jeremy Beck) in the Mint Theater Company production of Stanley Houghton’s Hindle Wakes. Top: Mrs. Hawthorn (Sandra Shipley) and daughter Fanny (Rebecca Noelle Brinkley). With the factories closed in the fictional mill town of Hindle, Fanny Hawthorn (Rebecca Noelle Brinkley), like many fabric workers, has retreated to Blackpool for its seaside amusements and the company of other young people. Encountering Alan Jeffcote (Jeremy Beck), a rich kid from back home, free-wheeling Fanny agrees to “hook up” with him (in the 21st-century meaning of the term). Alan is the scapegrace son of Nathaniel Jeffcote, the self-made businessman (Jonathan Hogan) who employs Fanny, her father, and much of the town’s working class. In the rigidly stratified society of northwest England, where the nouveau-riche Jeffcotes account for a great deal and the hardscrabble Hawthorns for little, gossip about Fanny’s affair with Alan could yield a host of complications, some which the casual lovers might foresee, others they couldn’t imagine. Fanny’s parents (Ken Marks and Sandra Shipley), evangelical and protective, put two and two together right away when a tragic coincidence reveals that their daughter has abandoned her female traveling companion and left Blackpool for parts unknown. Conscious of Fanny’s headstrong nature, the Hawthorns are uneasy about her virtue and her immortal soul, but they’re especially fearful for their family’s good name. A Hawthorn family fracas, with Shipley, Brinkley, and paterfamilias Chris Hawthorn (Ken Marks). Photographs by Todd Cerveris. Houghton’s brief writing career coincided with the active years of Arnold Bennett and George Bernard Shaw (both of whom were older) and D. H. Lawrence (slightly younger). Houghton’s depiction of the Lancashire fabric-mill folk is as vivid and specific as Bennett’s of the denizens of the Staffordshire potteries and Lawrence’s of colliers in Nottinghamshire. What’s more striking, though, is how much Houghton’s heroine, Fanny, resembles Shaw’s independent-minded female protagonists—Vivie Warren, for instance, and Eliza Doolittle. With Fanny, Houghton defied the expectations of audiences accustomed to the classic young-woman-in-trouble melodramas of that era. She’s a robust, pleasure-seeking character, quick to acknowledge that her appetites are the same—and every bit as strong—as those of her would-be seducer. Fanny can’t be seduced because she’s a willing accomplice. Her story is a comedy-drama about sexual mores, class distinctions, and gender politics in provincial England just prior to World War I. Under Kaikkonen’s sensitive direction, the cast is a compelling, well-calibrated ensemble. Beck, who recently demonstrated impressive range in the TACT productions of She Stoops to Conquer and The Gravedigger’s Lullaby, finds far more that’s sympathetic in Alan, the spoiled, upper-middle-class twit, than one might reasonably expect. 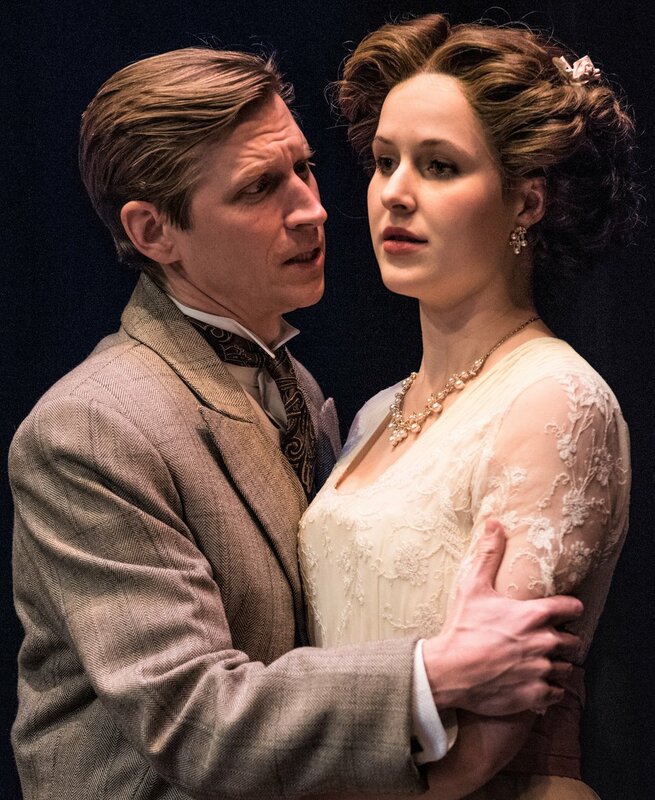 Beck and Emma Geer as Beatrice Farrar, his fiancée, in Hindle Wakes. As Alan’s parents, Hogan and Jill Tanner convey believably the raw-knuckled ambition that drove them from childhood labor at the Hindle looms to the pinnacle of the town’s social hierarchy. Shipley balances the pious Mrs. Hawthorn’s self-righteousness with the pain of a mother who, wanting the best for her only child, sees disaster in the offing. And Marks is touching as the play’s sole adult character who’s ungrudgingly kind. The Mint has given Houghton’s neglected play a handsome physical production. Charles Morgan’s imposing set affords swift transition from the Hawthorns’ modest abode to the Jeffcotes’ mansion. Property designer Joshua Yocom has adorned the stage with varied items of eye-appealing Victoriana that illustrate the class distinctions of two households. Sam Fleming’s costumes and Gerard Kelly’s wigs speak volumes about the time, the place, and the status of the characters. Over the past quarter century, the Mint has amassed a solid record for retrieving lost theatrical treasures. With Hindle Wakes, the company is again in possession of pay dirt. It’s a good bet that, if Houghton had not died at age 32 (a year after Hindle Wakes premiered), his work would be part of the canon of English-language drama. 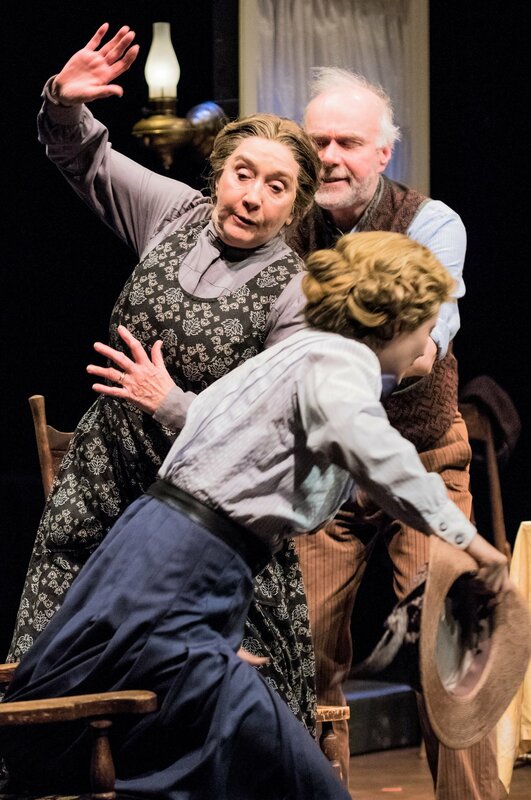 Hindle Wakes runs through Feb. 17 at the Clurman Theater at Theatre Row (410 West 42nd Street, between 9th and Dyer avenues.). Evening performances are a t7:30 p.m. Tuesday through Saturday; matinees are at 2 p.m. Saturday and Sunday, with a special matinee at 2 p.m. Wednesday, Feb. 14. For tickets and information, visit minttheater.org.